Unfortunately due to the possibility of inclement weather Saturday our Community Corners event at Rivergate is being postponed. All of the officers involved worked really hard to prepare for this event but with the forecast of thunderstorms during the day on Saturday the decision was made to cancel. There is no set date, as of this moment, to which the event will be moved to but I will relay that information to you as soon as it is decided upon. As always thank you for your time and support and we hope you have a wonderful weekend! 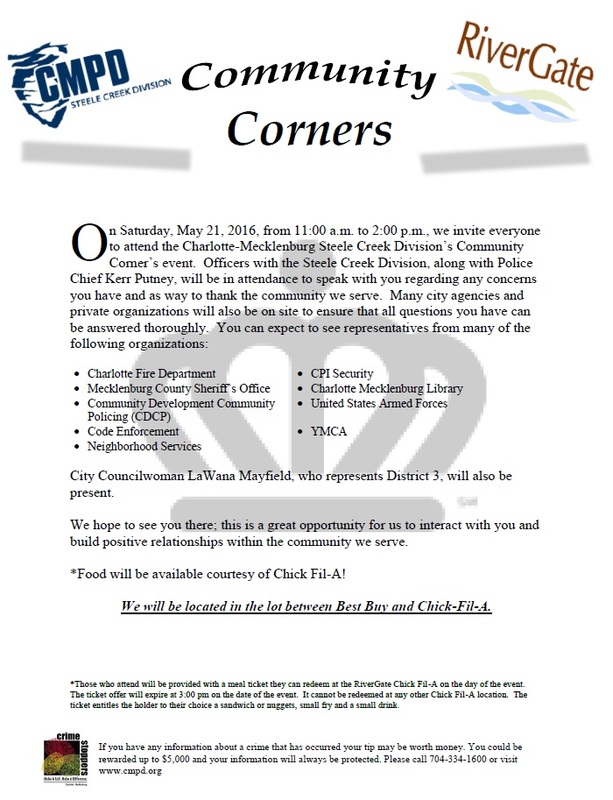 (April 22, 2016) The Steele Creek Division of the Charlotte-Mecklenburg Police Department will be hosting a Community Corners event on Saturday May 21st, 2016 from the hours of 11:00 a.m. to 2:00 p.m. It will take place at the RiverGate Shopping Center within the Best Buy and Chick-fil-A parking lots. Divisional officers, Chief Kerr Putney, a variety of city agencies (including Fire and Medic), and several organizations will be in attendance. Food and music will also be on hand. Officer Ron Hill, Community Coordinator for Response Area 3, said "We would like to use this event to thank you for the continued support, to address any questions or concerns you may have, and to meet the wonderful folks we serve each and every day. Please come out and join us for an afternoon of fun and community building! See you there!" To download a flyer in PDF format, click HERE or on the image below. If you have any questions, please contact Officer Hill at 704-336-8549.